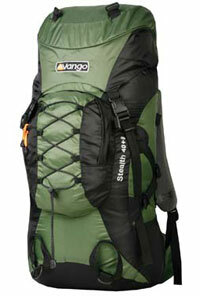 Vango says:"A new range of mid capacity bags designed for ultralite backpacking and moving fast in comfort. When combined with our range of Ultralite tents and sleeping bags these packs are just the right size for multi-day trips with no need to compromise. Make the step towards lightweight in comfort with Vango." The Vango Stealth 40 + 8 Rucksack is part of Vango's light weight range and features a single main compartment (plus compression straps for use without a full load), a good size zipped front pocket, lid pocket plus additional pocket containing the removable, high visibility (bright orange) waterproof cover. The storage options are completed by 2 water bottle pockets on the belt which also includes two zipped pockets for items such as camera or GPS batteries, car keys etc plus. There are twin loops on the front for poles/ice axe. The back system, which allows for some slight adjustment, plus the generously sized hip belt made for a comfortable trip with the winter day-walk type load I tried it with. I've used this backpack on a number of walks and it is fine - with plenty of pockets and compartments for my paraphernalia. However, the material used in the main body feels a little insubstantial so I have some doubts about its long term durability. This is an excellent value, light-weight backpack for overnight summer wild camping trips (using a bivouac) when you want to cover long distances quickly and only want to carry the essentials. If you need a pack for more frequent use, then it may be worthwhile investing in something more substantial. These days 1.2kg isn't really considered that lightweight.